It's been way too long (9 days) and I just wanted to post the updated pictures of my kiefer lime and compare it to the size of my lemon tree. The pictures were taken in my study/indoor planting area. As you will see in the photo there is still only one sprout. The other kiefer lime and blood orange haven't sprouted yet. I will be taking special care of that pot until the tree takes better root and grows some real leaves. Some of you are probably wondering what a kiefer lime looks like, so I have also attached an image of one. It kinda looks like a small green brain. The one I bought at HEB Central Market in Fort Worth was a large one since I was looking for seeds particularly. After I cut into it I found that the inside of the peel is smooth unlike the outside and the taste is like a normal lime but a little sweeter. You should never let fruit go to waste just because you are mostly interested in the seeds. The fruit wasn't the original reason for the seed finding and gathering though, it was the leaves. A simple recipe for a green curry with chicken is below. Heat a little oil in a wok or pan and stirfry 1 sliced oinion and a clove of minced garlic until the onion starts to turn clear on the outside. Add 2 tablespoons or so of green cury paste and cook for a couple more minutes.Add 1 3/4 cups coconut milk, 1/2 cup of chicken stock and 4 whole kiefer lime leaves (or kaffir as most people call it). Bring to a boil and add chicken cut up (hopefully boneless). Simmer on low for 20 minutes or more if you want it thicker. Add 1 tablespoon fish sauce, 2 tablespoons soy, a little lime juice, and a teaspoon of raw sugar. Make sure the sugar disolves before serving over the best thing since anything, RICE! Don't worry about the leaves, they're edible and you can cut them up before putting them in if you want. 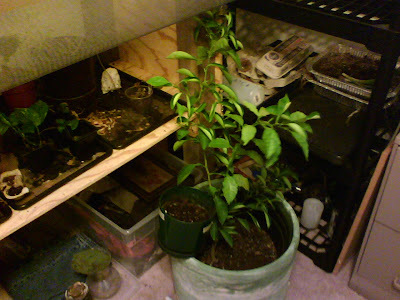 I went to tend the plant hutch in the study today only to find the newest member of the citrus family, a kiefer lime tree. I bought a kiefer lime because a recipie my wife wanted to make had required a few kiefer lime leaves. 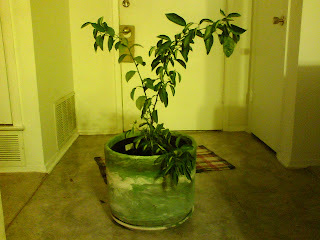 I ended up using a few lemon tree leaves instead since, as you know, I have a lemon tree. The lime I ended up buying ouly had two seeds in it. One has sprouted and the other is still sitting in the pot making up it's mind. I also have a blood orange seed in the same pot. The orange only had one seed. i haven't done any research yet on the blood orange, so I'm not sure it will make blood oranges or if I need to do some grafting. I have no experience grafting yet, but it would be a neat experience if it's needed. Below are two pictures. 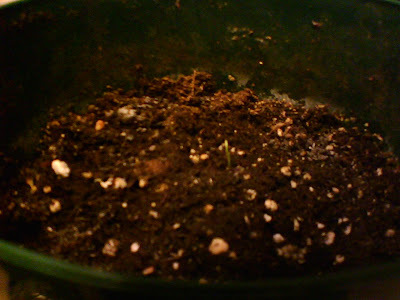 The first one is of the kiefer lime sprout slightly edited so you can see the sprout kinda clearly. 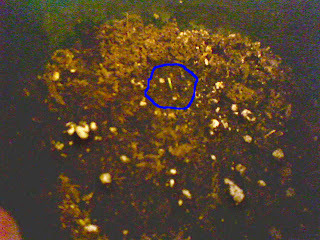 The second is edited with a circle around the sprout just in case you still cant point it out. I took the pics with my phone 1.3 MP. Several years ago I started a lemon tree. It began as a lemon wedge resting on top of the ice in a glass of water in a restaurant at which I was eating. Soon a seed was squeezed out of the lemon wedge and sucked on for several minutes until all the slimy coating was sucked off. I then commenced drying the woody coating by rubbing the seed between my palms until it no longer felt slippery. The husky coating was then stripped off using my stubby little fingernails a little at a time revealing a brown papery coating underneath. The papery coating was then carefully scraped so as not to damage the seed underneath until it gave way and started to peel off. What was left was a slick yellow seed with a tinge of green. Several hours later I planted that seed in a pot of dirt and watered it for many weeks until a fragile ovate leaf on a thin stalk appeared. This is usually where I would forget to water it and it would promptly turn brown and shrivle to nothing and the gnats would begin to swarm or a squirrel would try and bury a pecan in the pot. Or the one time i remembered to water it but forgot to give it drain holes and it drowned. This time however I remembered to do all the right things and it didn't die. It didn't even turn brownish. It also didn't grow past three inches for the better part of five years. Two springs ago I got the idea to bring this plant to the office since I had a window and could give it daily attention and I needed a plant to brighten up the cubicle. The little sprout seemed to think this was a good idea too and began to grow, to evryone's suprise since I had told them the story up to this point too. It started with just a little sprout to the side of the last leaf, of which it had four, and continued to get taller and taller. Not wanting it to grow in too controlled of an environment I put it on the balcony of the office. This wouldn't be and wasn't a problem since the balcony was a good nine feet above the ground level, even though the office was a one story building since it was built on the side of a hill. On the balcony I started feeding it ice instead of water because the temperatures were getting so hot and no rain was falling. Under these extreme conditions, freezing water on the roots and hundred degree air on the leaves, it thrived. That summer and fall it grew two feet and at least thirty leaves, most of which it still has since lemon trees are evergreens. It even still has a couple of it's original four leaves at the base of the trunk. I use the word trunk loosely since it's still only as large around as my pinky finger. Today I brought it inside to face a much more dangerous peril, the cats. i can only hope the two inch thorns are enough to keep the cats from eating all of the leaves off and killing it. It has been through freezing weather already this year but tonight it's supposed to get into the twenties. As far as I know it has never been exposed to such temperatures and I'm not in the mood to find out if it can this year. Maybe when the trunk gets bigger and I get it planted in the ground I will face this petrifying ordeal. I'm not sure if I'm ready to face the disapointment if it dies. I have very few things in my life that I have had longer and care as much about. There is of course my wife of twelve years and my cats of ten and eleven. There are also a few odds and ends that I have kept since my childhood that bring back memories when I didn't have to pay bills or have a job. I am trying to sprout some other lemon, lime, and orange trees to add to the citrus family I've started but I don't think any of them can be a replacement to the only tree I have yet to, and don't plan to, kill. I have asked my wife where I should put the tree, but so far we haven't come up with any viable locations. The cats get everywhere. This picture is of the tree in front of the front door where I set it down due to the weight. It's not so much the weight of the tree as much as the weight of the pot it's planted in. The coleus has finally rooted to the point where it is now able to be potted. I found a nice little pot, recently vacated by another plant and I will see how it takes to the dirt. The oleander at work is still rooting nicely but without a pot to put it in I'm not sure what will become of it. The office requires nicer containers than plastic cups. The frost came yesterday and killed all my outside basil. It was a sad moment when I got home and saw the brown dead leaves still clutching to their thing little branches. There's always next year. The majority of my plants are still thriving in the cold, what little there was, and are growing with renewed vigor. I will be bringing my lemon tree in soon before all the leaves fall off. I probably won't die, at least it didn't die last time that happened, but I still don't want to have to find out. I brought one of my basil plants in this year to see if it can make it over the winter inside and successfully make it back out in the spring. So far I've almost killed it a couple of times by forgetting to water it. It is with many of my other plants but I potted it in mostly sand and needs watering more often than the rest of them do. If it survives, I'll be doing it again next year with more plants. Pesto goes a long way but requires multiple plants per batch made. Seven years ago I cross polinated some day lillies and produced five seeds. Out of these five seeds, three of them germinated and one survived the winter on a balcony in the snow. Last year that plant flowered and has since been repotted and is doing well in my back yard. One day I just might have nice little patch of them if I ever figure out where I want to put them. Rock gardens are often overlooked as a landscaping element. Usually because people want flowers or veggies or something that is "normal". The rock garden is one of the more interesting, attractive and worry free parts of my yard. I can leave it alone for the most part and it thrives in Texas climate. About eight years ago I saved a small agave plant from being continually mowed down. I finally stopped neglecting and abusing the poor plant last year when I plantd it in my rock garden where it thrives and has greatly bulked up. Along with it I have planted an ice plant, crawling rosemary, hen and chicks, some sort of tufty grass, and a couple other plants interspersed with large rocks and I plan to actually add the sand soon. There is a little weeding and clearing of debris but this is minimal. Years ago I visited Galveston with a specific purpose in mind, to have fun. My wife on the other hand went that day to find out all she could about the 1900 hurricane that leveled most of the island. I didn't goof off the entire day, although I did get to see muppet fairy tales while my wife interviewed a historian, I actually learned about a plant that has eluded me for some years now. I probably would have come across it sooner if I had tried harder to look for it, snd by the looks of it no one else has been trying to find it save to destroy it. I'm talking about the saltcedar (tamarix ramosissima). At one time, a long time ago, Galveston was covered with the stuff and my guess is that's what kept it from blowing away. Now it's considered an invasive weed that dries up streams and salts the land. On Galveston that wouldn't have been a problem since it is pretty much impossible to oversalt the Gulf of Mexico or to dry it up. I don't think I will be planting one any tme in the near future but my curiousity has now been satiated, at least on this topic. Along with rooting, November is an excelent time for dividing and planting bulbs. In my garden I have divided my hyacinth, day lillies, spider lillies, lemon grass, onion and garlic. Garlic is also a good plant for keeping away pests. It helps keep red spider mites away from tomatoes and borers out of your fruit tres. Garlic will also help keep fleas out of the yard. Winter is hardly the time most people are worrying about strawberries. The season has passed some time ago and the space has since been cleared away for the fall and winter garden. Some of us that have that extra room to dedicate to these gems of the garden must prepare them for the long winter ahead.For this task I like to use hardwood mulch or bark but you can use a variety of materials that don't compost over the winter. Just remember to uncover them in the spring when new growth starts.